An inside source alleges that Roland Dickey, Jr., his wife Laura Rea Dickey, and his father Roland Dickey, Sr. charged millions of dollars in personal expenses to the franchisor of Dickey’s Barbecue Pit for personal travel, non-business meals, personal clothing and home furnishings. (UnhappyFranchisee.Com) Why does Dickey’s Barbecue Restaurants Inc. (DBRI) charge its franchise owners fees for everything from sales reporting to participation in online ordering? Why aren’t owners provided with the marketing and operational support needed to stem the epidemic of franchise closings nationwide? Why won’t DBRI provide franchise owners with the audited accounting of the franchisee advertising fund, as they are obligated to do by the terms of their Franchise Disclosure Document? Perhaps – just perhaps – it is because the Dickey family members who own DBRI prioritize support of their own lavish lifestyles over support of the struggling franchise owners from whom DBRI extracts its revenue. An inside source that purports it has (or at one time had) access to the DBRI general ledger alleges that from 2010 to 2015, Roland Dickey, Sr. and Roland, Jr. used DBRI funds to pay millions of dollars in excessive personal expenses for themselves and their family members. It wasn’t enough, according to this source, that Roland Dickey, Jr. and Roland Dickey, Sr. paid themselves millions of dollars in excessive salaries and secret payments made to look like legitimate 3rd party vendor expenses (See Roland Dickey Jr. Extracted Millions While Dickey’s Franchise Owners Fought for Survival), they also felt entitled to charge personal travel, meals and expenses to the company, including personal clothing for Roland’s wife, Laura. Roland Dickey, Sr. and Roland Dickey, Jr. (which we’ll collectively refer to as the “Rolands”) are, respectively, the son and grandson of Dickey’s Barbecue Pit founder Travis Dickey. From 2010-2015, The Rolands and their immediate family members (Sr.’s sister-in-law Martha, his wife Maurine, his son Cullen) owned the franchisor entity, DBRI. The source claims that DBRI’s general ledger itself separates “business” expenses from “personal” expenses for the Dickey family. The admittedly personal expenses that DBRI paid to members of the Dickey family from FYE May 31, 2010 through FYE May 31, 2015 revealed that, the Roland Dickey Sr. and Roland Dickey, Jr. funneled as much as $4.3 million of DBRI funds to pay their personal expenses. During that same period, they also paid approximately $162,000 of expenses for Martha Dickey’s side of the family. Roland Dickey, Sr. incurred more than $400,000 in meals and entertainment and over $1,000,000 in travel expenses. 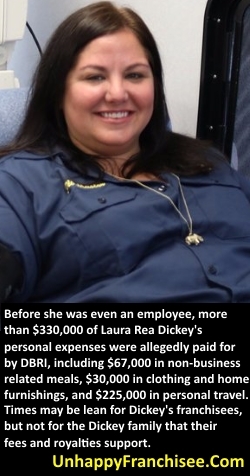 Our source alleges that Laura Rea Dickey was not an employee when $322,000 of her personal expenses (including clothing and home furnishings) were paid for by DBRI. About our information source: We believe the source of the information in this post is a credible inside source that has (or had at one time) access to the internal records and general ledger of DBRI for the relevant time period. However, it is possible that some or all of this information is flawed. We urge all interested parties to do their own investigation and let us know what they find. Also, we invite DBRI, Roland Dickey, Sr., Roland Dickey, Jr., Cullen Dickey, or their representatives to provide corrections, clarifications, and/or rebuttals for any information they deem untrue or misstated. for pennies. This sale was a corporate scam. I would love to sue and get my investment or at least part of it back. Lets see if the IRS goes after the Dickey family for tax evasion. They should suffer like all of the franchisees that were caught in this scam. Dickey’s is their personal piggy bank. Not just money, but free labor, too! I would also like to know as well I was a past owner operator got screwed over big time. Couldn’t even sell the damn store.